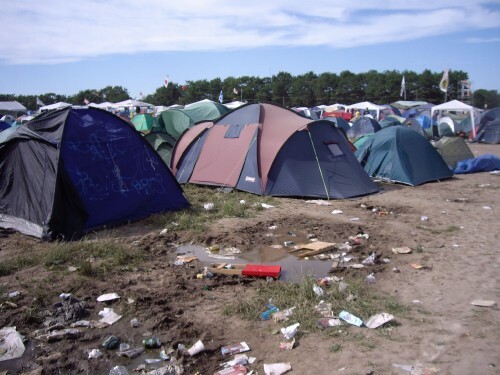 So I have returned from 8 nights camping at the Roskilde Music Festival. Anyone who wants to read more about the background and playlist can go here: http://www.roskilde-festival.dk/index.php?code=1 It was a hell of an experience, well different from what I was expecting. There's not really any music for the first 4 days (except for some up and coming Danish bands). The entertainment comes in the form of the human circus that inhabits the festival. Here's just a couple of the things I witnessed off the top of my head: Every piece of fashion inspired by music from the past 30 years, from pop to punk, glam to goth. Love Led Zepellin? Prove it by dressing up like them. A bunch of people walking around the fields in a fashion show with pool toys strapped to their back. A Porsche being pushed around (no engine), painted like the sea with starfish and sharks. And filled inside with water. And the passengers wearing snorkels and flippers. A guy wearing an outfit made out of duct tape. Wouldn't be looking forward to taking it off. Any number of themed campsites. Personal favourite was Van Damm camp. A guy being a dog barking at people and biting at them. It was just mind boggling the lengths people would go to to stand out. One evening we just sat by one of the main thoroughfares and watched the show go by. The festival organisation was really impressive. I only have the falls festival in Tassie to compare it too (which does a bang up job), but some of the stuff that was put together for the week was awesome. There a lake to swim in, one to fiash in. A movie theater. Communal BBQ's dotted around the camp site. Shuttle busses to and from town and from one side of camp to the other. ATM's, Internet cafes, hundreds to places to eat - I can't imagine how much work went into the organisation. Onto the music. I saw quite a few bands I wasn't expecting to and was pleasantly surprised most of the time. The highlights were: Scissor Sisters - Probably my favourite band that were on the playlist beforehand, and they didn't disappoint. Their cabaret roots showed with an amazing show that felt like you were watching a musical at some points. Fat Freddys Drop - Kiwi band I'd never heard of played a cracking set. Think Cat Empire but better. Pendulum - Another Aussie band with the more DJ/electronic bent. The played one of the smalled stages and the crowd just went off. It was so cool to be a part of it. Guns 'N' Roses - Truthfully, the didn't have enough material for an entire set. But hearing all there classics live was great. And they had fireworks. Biggest disappointment was Birdy Nam Nam, a collecting of Scandinavian DJ's that I just wanted to see cause of the name. Every song they did sounded the same and that song was crap. There were a few niggling annoying things as well. Rubbish bins weren't really supplied and everyonw would just throw rubbish on the ground. After 8 days of this some of the areas looked worse than anything I saw in Asia. We're told the entire site in bulldozed after the festival, but it was pretty grim towards the end. In the same vein, people (not just guys I will point out) would piss anywhere. There was some areas that towards the end that were so raicid you couldn't stand still there and there was permanent mud puddles even though it hadn't rained for days. It was sort of understandable that it would get like this with 100,000 people camping in the same region for a week, but when you see someone take a leak 10 metres away from a provided urinal you have to wonder whats going through their brain. (Probably a crap load of booze) Sothats Roskilde, did anyone get through all of that? In Norway now, very cool and very, expensive. And its so warm - I saw the weather report for Australia today, I'm so sorry!